The United Kingdom is bidding to build on Gibraltar’s existing access to the UK market for financial services and will push for a “sensible arrangement” to ensure fluidity at the border, according to the UK Government’s junior Brexit minister. Speaking yesterday during a visit to the Rock, Robin Walker, the Parliamentary Under Secretary of State for Exiting the European Union, also reaffirmed Britain’s double-lock sovereignty commitment to Gibraltar and said that Gibraltar’s future relationship with the EU would form part of the UK’s wider Brexit negotiations, according to a report in The Gibraltar Chronicle. 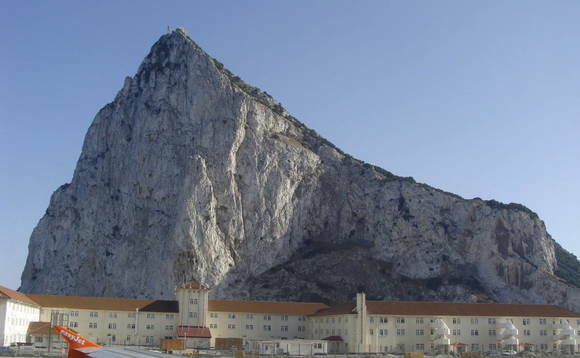 The Gibraltar Government says 90% of the Rock’s trade in financial services is with the UK, making it a vital element of the territory’s economic stability. “When it comes to financial services, there are strong mechanisms already underpinning Gibraltar’s access to the UK market which are enshrined in UK law,” Walker said during a press conference at No.6 Convent Place, pictured below left. “It’s our intention to maintain Gibraltar’s current access to the UK market in financial services and we’re examining together where we can broaden our economic cooperation and increase market access. “We will also take into account the priorities of Gibraltar and the other overseas territories as the United Kingdom works to establish new trade and investment agreements with the wider world,” he said. Gibraltar’s chief minister, Fabian Picardo, also pictured left, described Walker as “a good friend of Gibraltar” and thanked him for taking the time to visit Gibraltar just days before UK Prime Minister Theresa May is expected to trigger Article 50 and begin the formal Brexit process. Walker added that the UK Government is at odds with Spain on a core issue when it comes to Brexit and Gibraltar. “The UK deeply values British sovereignty over Gibraltar and is fully committed to promoting the interests of Gibraltar and the wishes of Gibraltarians,” he said. As reported, Spain has repeatedly insisted that once the UK triggers Article 50 and begins the formal process of withdrawal, Gibraltar should become a bilateral issue between London and Madrid. But that is not a view the UK shares. “I think we need to be clear that in these negotiations we are talking to the European institutions and indeed the 27 member states, of which Spain is one,” added Walker, when asked how the UK would approach the discussion over Gibraltar. “We will need to have contact at every level to make sure that the process is successful,” he said.